← One Pot Chicken Noodle Soup! Admit it. It’s OK. Don’t hold back. “I LOVE CHOCOLATE!” Phew. I feel better now that I got that off my chest. How do you feel? It is always good to just let it out. No sense holding it in and pretending that now that we are eating whole, unprocessed, nutritious foods that we just forgot about chocolate. I know some people like to pretend that “I just don’t like it anymore now that I am eating better” but is that really the truth or just what they want people to think? It is NOT a character flaw to love chocolate. It is not a weak will. It does not show lack of self control. It is perfectly OK to enjoy chocolate. In moderation. In the most healthy way possible. 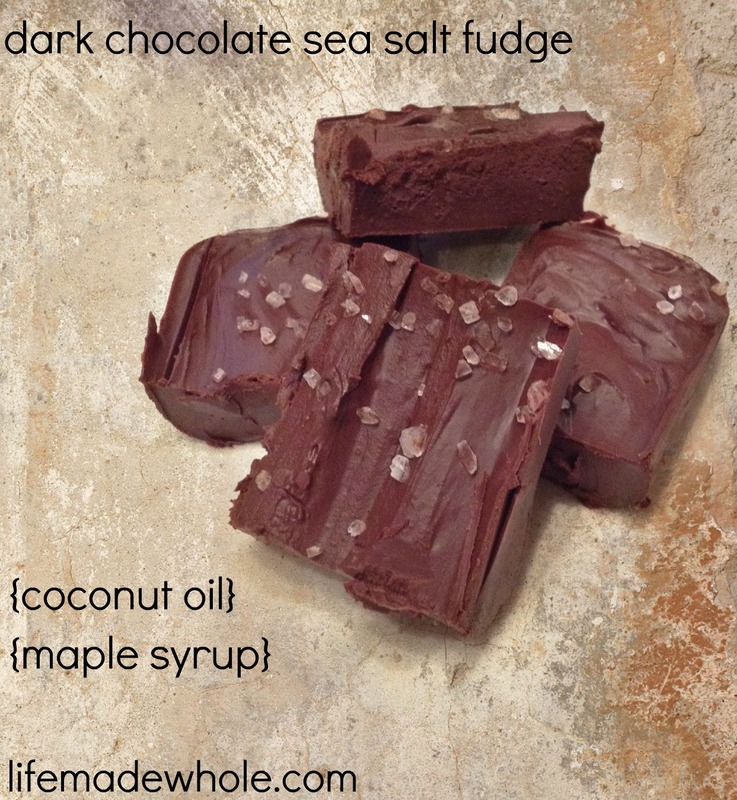 I made this fudge with 3 ingredients. That in itself is pretty great. Dark chocolate bar. Maple syrup. Coconut oil. The one flaw that this healthy chocolate fudge may have is that the chocolate bar has evaporated cane juice which is closer to refined sugar than I generally like but the remaining ingredients were good – cocoa mass (73%) and cocoa butter. Since this is for a special treat, I wasn’t overly concerned about the minimal sugar. Heat chocolate over low heat until melted. Add coconut oil and maple syrup. Stir until coconut oil is melted and begins to thicken (for about 30 seconds.) Remove from heat and continue to stir until it gets to the fudgy consistency. Sprinkle in sea salt. Spread into a small pan (I used a mini loaf pan) and sprinkle a little salt on top. Place in fridge. Fudge will be ready in about an hour; once it cools. If you want it to maintain a softer, fudge-like texture, do not store in the fridge but in a cool area. If you don’t mind it harder, like candy, the fridge is a great place. This entry was posted in Desserts, Easy Kid Treats, Food and tagged chocolate, coconut oil, fudge, maple syrup. Bookmark the permalink.